China says most of its citizens in Iraq remain safe, but a mass evacuation remains on the table should violence worsen. As the security situation in Iraq continues to deteriorate, China is growing increasingly concerned for the safety of Chinese citizens within the country, many of whom are employed by China’s oil companies. The Foreign Ministry is actively working to evacuate a small minority of Chinese workers, but is hoping that a mass evacuation (in the style of the 2011 pull-out from Libya) will not become necessary. According to Foreign Ministry spokesperson Hua Chunying, there are over 10,000 Chinese employees working in Iraq, most of whom are in the south, far from the current fighting. 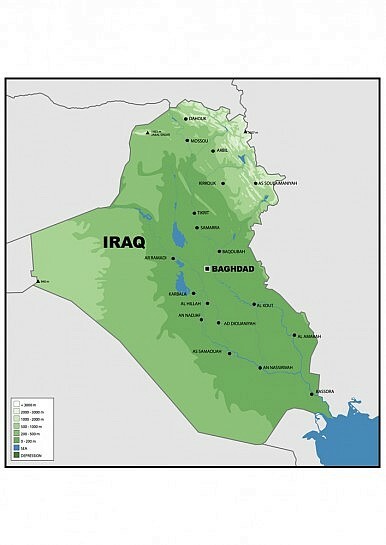 As Hua noted, the Chinese workers “are concentrated in relatively safe areas” — with the key word being “relatively.” One employee of the China National Petroleum Corporation (CNPC) was kidnapped from the Halfaya oil field (located in southeastern Iraq, near the Iranian border) on June 12. The employee has since been released and is safe, China’s Foreign Ministry reported. While most of the Chinese citizens in Iraq and concentrated in the southern oil fields, far from the current conflict zone, Global Times reported Wednesday that over 1,000 Chinese workers at a northern construction site had been left stranded by the violence. The workers, from China Machinery Engineering Corp, had been building a power plant in Samarra, a city in the northern half of Iraq on the Tigris River. Iraqi government forces and militants from the Islamic State of Iraq and Syria (ISIS) have clashed over Samarra in recent weeks. China is preparing to evacuate citizens in areas with a “grave security situation,” Hua Chunying told reporters on Thursday. China’s main focus for now is the workers based in Samarra and Wasit province. Hua did not specify if these citizens would be moved to safer areas within Iraq, or if they would leave the country entirely. However, she noted that Chinese embassies in “relevant” (presumably neighboring) countries were working on streamlining the entry and exit processes, hinting that at least some of the Chinese workers will be sent across Iraqi borders. From Chinese media reports, it appears that an attack on Baghdad would be the tipping point for an evacuation. A source from China National Offshore Oil Corp told Global Times that “if insurgents being to attack Baghdad, we will pull out of the country immediately.” That moment may be drawing near — ISIS militants have reportedly seized control of an oil refinery 130 miles to the north of Baghdad. The facility at Baiji is the first working oil refinery to fall under ISIS control. Meanwhile, China remains firmly in support of the Iraqi government, but continues to be vague about how far Beijing will go in aiding Baghdad. In Thursday’s press conference, Hua Chunying said that fighting terrorism is a “common responsibility” among the entire international community, and Iraqi stability is a “common interest.” “Therefore,” Hua said, “all sides should support and assist Iraq in its reconstruction and counter-terrorism efforts.” Hua added that China was willing to provide what help it could to the Iraqi government, but did not specify what form this aid would take.